Who are you? I mean really. Who are you? What are you doing here on this earth? From where or what do you claim your identity? I’m the baby of the family. I’m a small-town girl. My family hails from Germany. I’m a wife. I’m a mom of boys. On and on it can go, searching for ways to describe ourselves or our lives. But, what do all of these identifiers have in common? Can you find it? All of these descriptions of me are based on my similarities or comparisons to things in this world or other people. If someone asked you, “so, tell me something about yourself,” what would you say? Better yet, how do you think of yourself? Recently, I spoke at the Rooted in Faith women’s conference where we were teaching about our identity in Christ. My message was this: Look UP, not around! You are loved, chosen, and filled! You were formed and created by God. He made you just the way you are for certain reasons, His reasons. Consider these scenarios: if you took several hours creating a fantastic sand castle on the beach, would someone else have the right to walk by and kick it over? Or, would you allow your child to run over and destroy another child’s lego creation? Of course not, right? 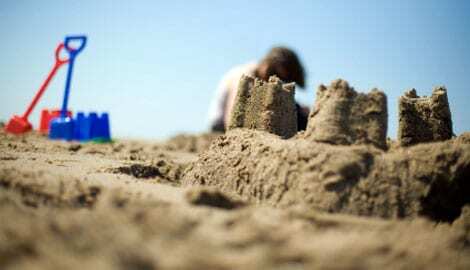 But, what if you wanted to knock down your own sandcastle before you left the beach? What if your child decided to ditch the lego project and tear it apart? That would be okay. It would be the creator’s prerogative wouldn’t it? Whatever we are, whatever we have, whatever we experience — all of it needs to remain in its proper place — in the mighty hands of our Creator God. You are His. God’s vessel, created by the potter Himself. You were formed a certain way to serve the One who created you. Look to Him, the One True God, to tell you who you are and what your purpose is in this life. Don’t let anyone else (or yourself) knock down or kick over His creation! No one has that right except God Almighty — not even you! Next week, I’ll post Part 2 of this lesson: You are loved, chosen, and filled!